I don’t really care for spaceships. 2001 is special and so is Dark Star but Star Wars, Star Trek, Stargate and THX 1138 make me sleepy. I like more temporal science fiction: Stalker, The Man Who Fell to Earth and stuff like that. It could be that I’m less interested in sci-fi and more into psy-fi. If psychic fiction is a thing, then The Congress is that. I didn’t watch a trailer or anything before getting into this. A friend of mine said it sounded like a weird movie with Robin Wright — that’s all I wanted to know. Turns out that was pretty accurate and I’m gonna tiptoe around this one and try not to ruin it for you. So yeah, it stars Robin Wright and she’s playing an actress called Robin Wright who’s getting a little older. It seems the good roles have stopped coming her way, and it also seems her focus has mostly shifted to raising her kids. They live in a retrofitted airplane hangar right on the edge of an active runway. Her son has a degenerative hearing and vision condition, and her daughter is kind of a brat. We learn about all her career choices through her agent, played by Harvey Keitel. The film weaves a lot of truth into the fiction, citing iconic roles like Buttercup in The Princess Bride and Jenny from Forrest Gump. Those, of course, are the good choices, but Keitel needles her over the bad ones. I’m not a Robin Wright historian, so I can’t confirm any of those. Anyway, they paint an image of a career in decline and it’s not hard to sympathize — she’s great. This all leads up to a grand proposal by a big-time studio exec at “Miramount Pictures” played by Danny Houston (who’s also great), that Robin Wright sell her likeness to Miramount for a lot of money. They will scan her image and emotions and have the ability to manipulate all of it for whatever purposes they choose. They’ll make movies with her, only without her. The main catch is that she can never act again, anywhere. She eventually takes the deal for the good of her family; it’s a painful sacrifice. Her final role is played out in a machine that I could best describe as a transparent Gravitron. She stands in the center while Harvey Keitel makes her cry and laugh. The machine, mechanical and cold, captures everything. We flash 20 years into the future and get a glimpse of how Robin Wright has changed. She still looks great and totally castable but there’s something dead in there. She drives through the desert in a dirty Porsche Carrera and arrives at truly bizarre destination. If you don’t know anything about this movie, I’d rather leave this part blank. The surprise here is what really hooked me. For the sake of finishing this article, I’ll say she enters a hallucinatory zone haunted by the spoils of wish fulfillment. Miramount has gotten incredibly powerful and is manipulating more than just films. They’ve created an artificial world of free-flowing excess populated by mismatched celebrities from all eras who mingle among classic works of art and talk about nothing. It feels a lot like Dylan’s Desolation Row in there. They have instant access to whatever should bubble out of the ol’ id: liquid hedonism. No rules, just right. As you might expect, the artificial paradise appears to be doing more harm than good. 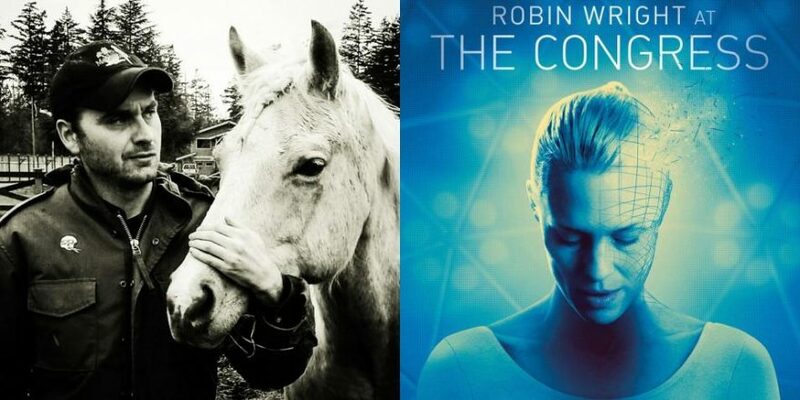 Robin Wright gets lost in it and is soon a total brain-wreck. She finds a gentle soul therein, played by Jon Hamm. He’s a spirit guide of sorts, but not a super effective one. There are many, many wrinkles to this tale, all located in this particular area of the film. It plays out like an acid trip and it’s probably best to let viewers find their own way through it. For better or worse, the emotional center of the film is based around Robin Wright’s bond with her son. Depending on how moved you are by that story line may determine how effective the film ultimately is for you. Full disclosure: that part kind of missed for me. And since I’ve opened the door, I also have to confess that many of these performances don’t hold up to Robin’s. It’s a little tricky and I respect the effort but she’s just really good and false moments are really gonna stand out when she sets the bar so high. OK, negative paragraph over. I respect what Ari Folman is doing here. This is his baby and I’ve never seen one like it. He adapted it from a ’70s Polish novel called The Futurological Congress by Stanislaw Lem and I’m totally gonna read it. There’s amazing ideas in there. I was often reminded of the 1973 movie The Hourglass Sanatorium, also Polish and also littered with Dylan-esque imagery. This is a my kind of movie and if you’re a fan of trip cinema, you gotta see this in the theater. If you’re a fan of tripping when you’re in the theater, don’t miss this opportunity. It might not hit on every cylinder but Ari Folman is a gambler and so is Robin Wright. I support that.